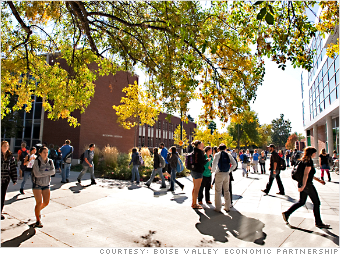 At Boise State University, college and graduate students can take specialized courses at its Center for Entrepreneurship. Don't be fooled by the calm mountains and rivers of Idaho's picturesque Boise Valley. Nestled in their midst is a burgeoning hub for technology and science startups. Big names like Micron Technology and Microsoft already operate in the state, and are inspiring a new breed of tech companies hoping to follow their lead. Idaho's national laboratory is spurring innovation in technology, nuclear science and engineering, said Clark Krause, executive director of the Boise Valley Economic Partnership. Meanwhile, colleges in the state offer specialized business courses for budding entrepreneurs, he said. New firms can take advantage of unique initiatives like the Boise Metro Chamber of Commerce's "B Launched" competition, which awards promising young entrepreneurs funding to build their ideas into startups. Growing businesses can get tax credits for adding new jobs and expanding facilities. While high personal income and business taxes can be a turnoff, overall living costs are low and Idaho is a strong hydropower state so entrepreneurs can save on electricity bills.